For once, police were thankful a group of criminals broke into a car. A group of inmates on work duty in New Port Richey, Florida, came to the rescue of a forgetful father who accidentally locked his keys -- and, more importantly, his 1-year-old baby -- in his truck earlier this week. 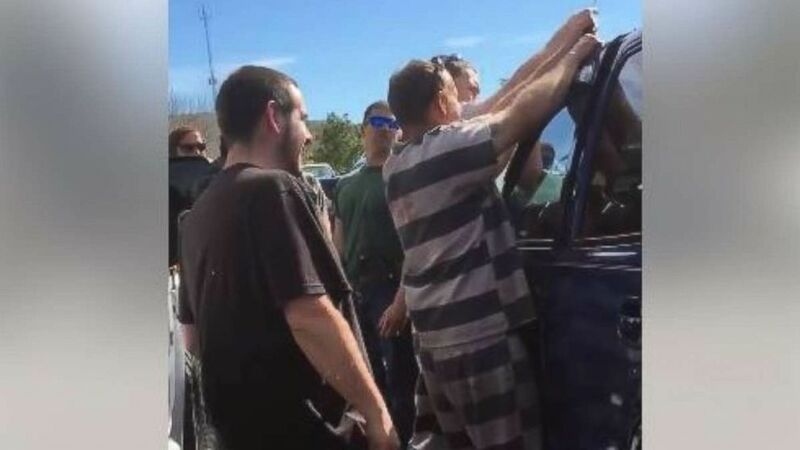 Five prisoners, along with deputies from the Pasco County Sheriff's Office, were working to repair medians outside the West Pasco Judicial Center on Thursday when they saw the father begin to panic and a crowd gather around the locked car. "[We were] surprised when somebody had a wire coat hanger, [and] we were able to get the door open enough to get it in there, unlock the door," Richard Stanger, from the Pasco County Sheriff's Office, told Tampa ABC affiliate WFTS. The inmates were described as "low-risk offenders." "A lot of them, like these individuals, they know they made bad mistakes, bad choices, but they want to do the right thing in life," Pasco County Sheriff Chris Nocco said. In a cellphone video shot by the truck's owner, deputies can be heard telling the dad to "pop his head in the window" every once in a while, so the baby doesn't get scared by all the "strange faces." It took about two minutes for them to pop the lock -- and trigger the car alarm -- in order to get the baby out of the truck.